This emphasizes how in our age there is an awareness that many theories are rather outdated (and, much like everything else, will inevitably be challenged and overturned). Thus, precisely in our time, so liquid and volatile, a hyper-modern theory of the subject and of relationships that focuses particularly on their complexity and uniqueness seems fitting; this is particularly helpful today, both to our profession, and therefore also to the subjects—hyper-modern couples and families who ask for help. This chapter proposes a psychoanalytic perspective that manages to put itself to the service of present-day needs, and not to ask instead that subjects adapt to it and its theories, forcing them into a “Procrustean bed” against their will. We align with a flexible psychoanalysis, which is known to decline in various hyper-modern contexts (both individual and group/family). 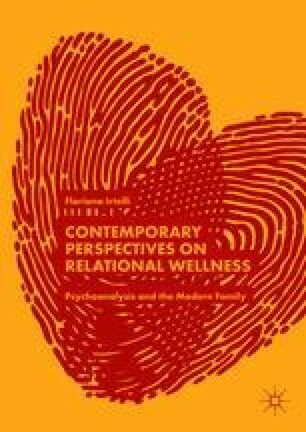 Throughout this journey between theoretical developments, contemporary research and clinical practice, what stands out is especially how important it is to delve deeper into the specific topic of relationships and the family, an increasingly complex, multifaceted entity.